Let’s start off African American History month with one of my favorite artists, John Biggers. The theme for this month in School Arts Magazine is “Messages,” so let’s examine what Biggers promoted to young African American students as one of the great educators of the 20th century. Biggers grew up during the Harlem Renaissance, a flourishing period in African American art. It developed after the mass migration (1918-1925) of southern blacks to northern industrial cities where they felt that job opportunities were better. The concentration of large urban communities of African Americans produced a fertile artistic and literary climate (both traditional and avant-garde) that became a springboard for later African American art movements. Biggers was born in Gastonia, North Carolina. As a child he was inspired to be an artist from his childhood experiences. While at Lincoln Academy in King’s Mountain, Biggers drew while working in the school’s boiler room. Although he originally attended Hampton University in Virginia to become a plumber, a teacher urged him to go into the arts because of his obvious talent. After studying with the artist Charles White in the 1940s, Biggers went on to paint murals in the regionalist/realist style, concentrating on the history of the African American community. Although Biggers’ early works emphasized the struggles of American blacks, they also pointed to the proud heritage of African Americans. In Biggers’ works, the every day lives of African Americans showed the dignity and value of African American life, something he would later go on to show in his images of Africa itself. He became a prominent educator at SMU in Houston, teaching generations of African American youth to be proud of, and visualize, their heritage. In 1957, Biggers became the first African American artist to visit Africa on a UNESCO grant. His experiences in Africa changed his dominant subject matter from urban scenes of black life to those from Africa, the heritage of African Americans. 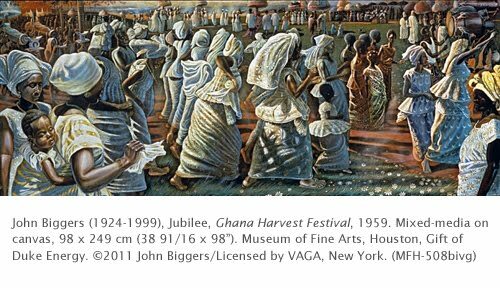 Ghana Harvest Festival is a result of his 1957 Africa visit during which he documented in sketches the daily life and festivals of African people. The festival depicted in Ghana Harvest Festival is most likely a durbar of the Akan culture, a celebration in which the local leader celebrates his stewardship of the people and receives the loyalty of local sub-leaders. Striking in his works after his African trip is Biggers return to realistic monumentality from his earlier cubist-inspired works. Correlations to Davis programs: Explorations in Art Grade 5: 1.3, 1.4; A Personal Journey: 1.1, 2.1; A Community Connection: 7.1; The Visual Experience: 14.3; Discovering Art History: 4.8. His pictures are pretty famous, but i didn't know much about his life.